Brian Phillips is a writer for Bill Simmons' sports and pop-culture website Grantland.com. His writing is gorgeous. Last year, he wrote several articles about Roger Federer that include some of the most lyrical sports writing I've read in a long time. The other day, he wrote an article about Pele (likely the greatest soccer player of all time) on the occasion of Pele's critical comments about Lionel Messi (likely the greatest soccer player playing today). 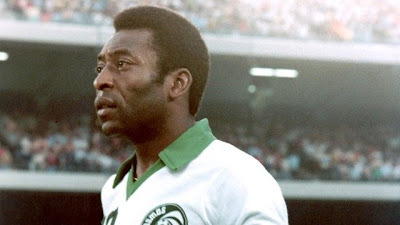 But then part of Pele's post-career shtick is that any high praise given to another player in his presence is a boorish deviation from the continuous celebration of Pele mandated by Pele as part of the ritual of Pele. Pele doesn't give respect. He can't; it's all been trapped by the pull of his own gravity. The truth is that it is sensationally pleasant to mean something to people. However enervating celebrity can be, however bleary you feel after the 500th radio interview or spiritually dead after the 1,000th Vanity Fair party, there is a low-level electrical hum that goes along with mattering that I suspect becomes almost impossible to do without. That the world loses its color, etc. Think about this: For 20 years, wherever Pele went, the fact of his being there became that place's organizing principle. He was the most famous person in the world, "the most loved athlete in the history of sports," as Jon Miller put it in the broadcast of his last competitive game. In every situation he experienced, the fact that he was there experiencing it was, to everyone else, its defining characteristic, the whole thing. I love the way Phillips puts it: "it is sensationally pleasant to mean something." Pele meant so much to so many for so long that the idea that someone else could mean as much is heresy to him. Wouldn't you do what it takes to stay out of the display case, day to day? To keep your life your life? I would, I'm pretty sure, even if it meant that other people, somewhere off camera, rolled their eyes and snickered when I talked. We are this way. We'll do whatever we can to maintain our meaning. For Christians this is what makes giving up on the idea of our "free" will so difficult. "You mean I'm not in charge of this whole thing?" "You mean it's not all up to me?" Pele can't abide not mattering. In order to maintain his importance, he cuts down anyone to whom he is compared. We can't abide not mattering, either. In order to maintain our importance, we subconsciously (and continually) reduce the importance of Jesus. "After all," we think to ourselves, "it was our good decision to invite him into our lives in the first place." Luckily (though painfully) for us, God's primary work is tearing down our idols, and he often begins with our self-sufficiency, our "meaning." After what is often a rude awakening, we are given the best gift of all: the knowledge that it is no longer we who live, but that it is Christ alive within us (Galatians 2:20).